Humour in artificial intelligence agents: Yah! Crowd goes wild! Again! Yah! Crowd goes wild! Again! 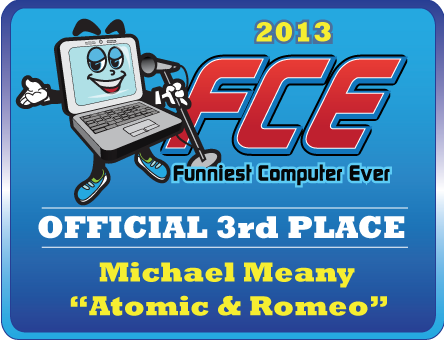 The results of the 2013 Funniest Computer Ever (FCE) Competition have been released. Atomic and Romeo came in equal third place with Owen Niblock's Gig-A-Tron 5000. This is a particularly pleasing result - this year attracted a larger field (12 entrants) and, like last year, included some serious 'heavy-hitters'. For example, Mitsuku, by Steve Worswick, who also won the Loebner Prize this year, took out the 2013 FCE as he did last year. Second place went to Carlos Chow written by Elizabeth Perreau. The results have been published on the FCE site.